I recently received an email from Google notifying me that some photos of mine are extremely popular. Years ago I submitted 5 photos to Google Maps in an effort to help boost the popularity of the Toronto Archery Range located at E. T. Seton Park. Those photos have since apparently gone a bit viral, with over 300,000 views. Woot? Sure, what the heck. Woot! During that time I have also seen attendance at the Toronto Archery Range skyrocket. Much of that is largely due to the Hunger Games and other film / TV franchises. But the good people of Toronto wouldn't necessarily know we even have a public archery range. That is the real trick. 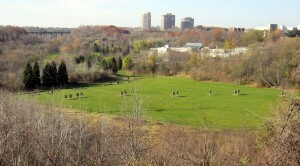 The range is one of Toronto's best kept secrets, as the vast majority of people don't even know that the place exists. When I first started going to that archery range in 2009 it was usually dead quiet there and you would be the only person there most of the time. On a busy day there would be maybe 3 people there, and they were the "regulars" and you would get to know them all by name. During the height of the Hunger Games/etc visitors to the archery range exploded, with crowds of 15 to 30 people there regularly, or even 60+ on the really busy Saturday mornings. So clearly the word that the place existed was getting out. Huzzah! Last year it was so busy I found myself wistful for the quiet days back in 2011 and prior to that, when archery was comparatively less popular. Recently visitors to the range has dropped off in 2016. A sign perhaps that the archery fad has slowed down a bit and only the true archery fanatics are sticking around. However as the archery fad of the 1940s to early 1970s shows, these things come in stages. The 1940s-1970s fad lasted 4 decades, spawned largely due to all the Robin Hood movies in the 1940s. (There was literally dozens of them, beginning with the 1938 film "The Adventures of Robin Hood" starring Errol Flynn and showing the archery skills of Howard Hill.) The fad ended a few years after 1973, the year Disney made their animated version of Robin Hood. Deliverance in 1972 was also part of the same fad. A brief archery fad in the 1980s sparked up after the making of the 2nd and 3rd Rambo movies. Another one followed with Robin Hood: Prince of Thieves in 1991. A small one occurred after the first Lord of the Rings film in 2001. But those fads were all relatively small. Especially compared to the decades long fad of the 1940s-1970s era. In this era of smartphones, the internet, and cable television it is very difficult for people to get motivated to go outside - thus it is also more difficult for large numbers of people to get involved in an outdoor sport. We will likely never see an archery fad as big as the one which occurred between 1938 and 1975.